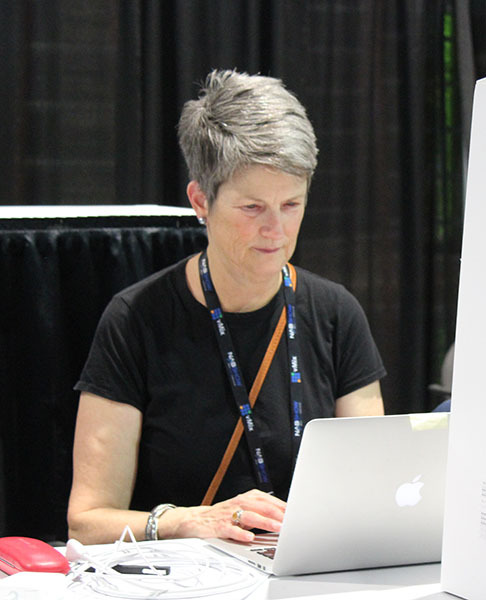 I’m writing this from our booth – SL-10527 – at the 2018 NAB Show. After a full-day of setup, most everything works. Not everything, THAT would make me nervous. But enough is working that I can get some sleep tonight. 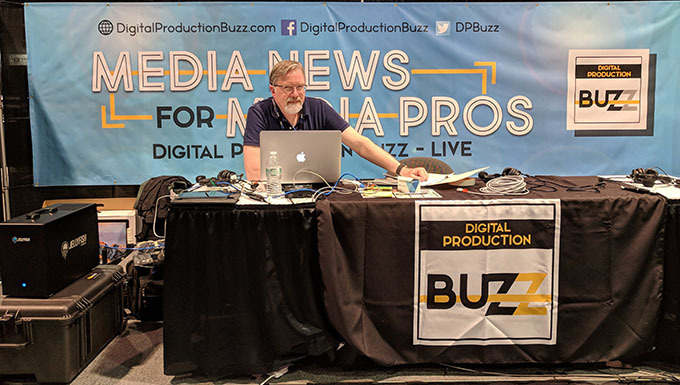 As we’ve done for the last ten years, we are podcasting live from the NAB Show – 27 shows in three-and-a-half days. 88 companies, 102 interviews. 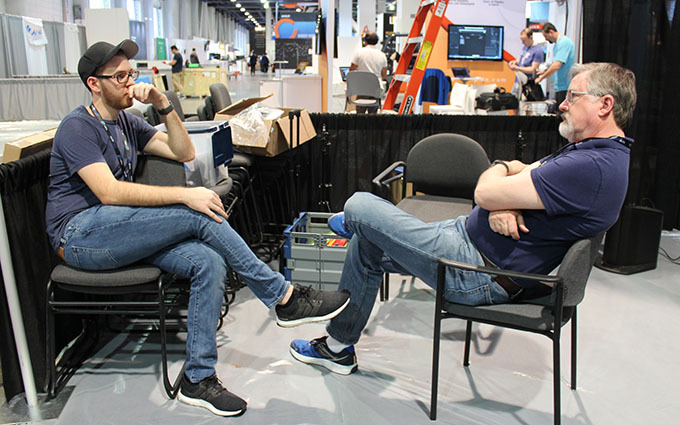 We have basically set-up a broadcast-quality radio station in a 20×20 trade show booth. You can follow all our shows at: NABShowBuzz.com. 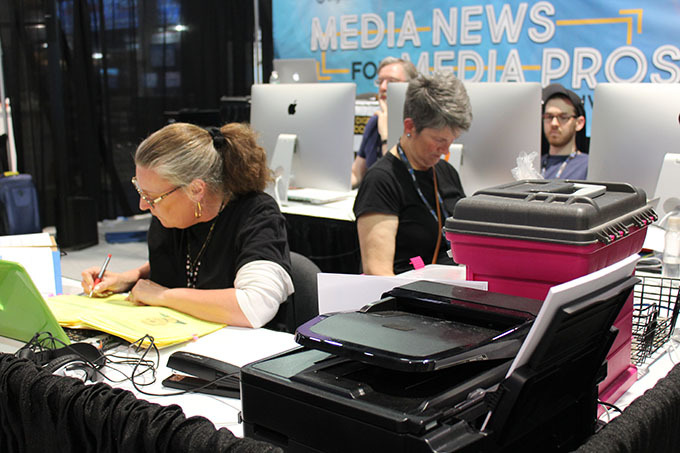 We have a production team of eight people, all working in the booth on these live shows. The team is led by producer, Debbie Price. 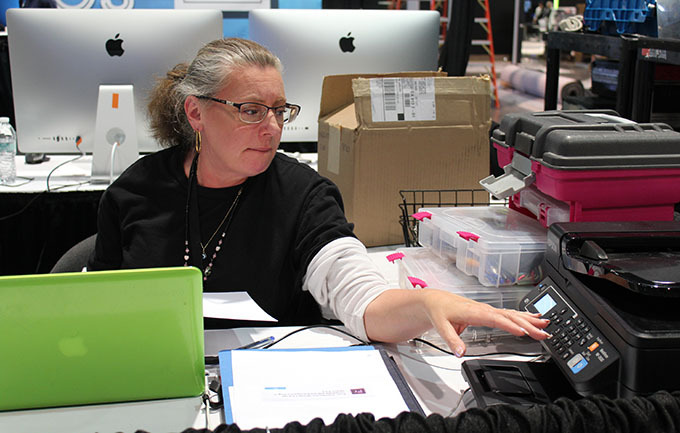 In addition to being the booth den mother, she is responsible for everything – NAB relations, guests, staff accommodations, budgets – everything except tech. Tech is left to me. As you can see here, I’m deeply involved in, um, texting on an iPhone. We have an 8 x 12 foot presentation stage at the back of our 20×20 booth, which I and the guests sit at. This year, we’ve added lights from LitePanels to give the space some “show biz,” along with some lovely Bose column speakers as our PA. The Bose system puts out a great volume of sound in very little space, with a sub-woofer built into the tripod base. 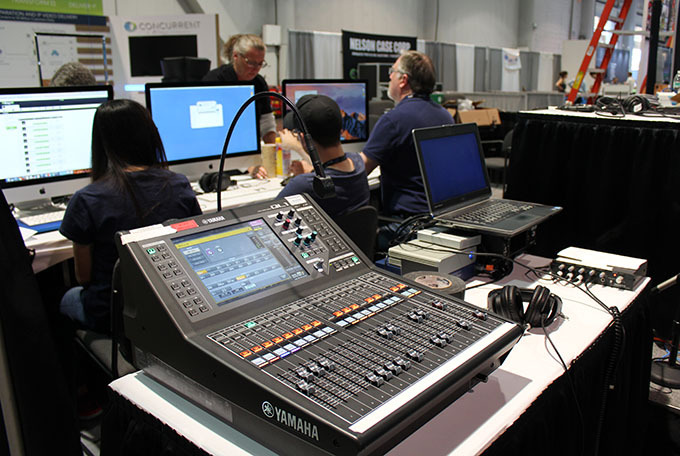 When it comes to audio, we are mixing on a Yamaha QL1 digital mixing console. For headsets we are using Sennheiser HMD-26 headphones. I like these over-the-ear systems because they are designed for sports broadcasting and allow us to reduce the trade show noise, without eliminating it. This means that guests can be heard, but still with an underlying excitement provided by the ambient sound of the exhibition floor. 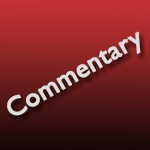 Shows are streamed live to NABShowBuzz.com every hour on the hour, as well as recorded for posting to the website later. We stream using Mixlr.com. We record the audio using Adobe Audition, with a Dante feed from the Yamaha. Dante provides audio-over-ethernet cable which eliminates the need for excess analog cables, while providing a very clean digital signal direct into Audition. NOTE: To get this to work, I also needed to install Dante Virtual Sound Card and Dante Controller, both from Audinate.com. This provides the audio interface for Audition. We have our own network and server in the booth so that as programs are produced live and recorded, we take the session files, store them on the server, then make sure all levels are good, create the different versions we need, then compress and distribute them. For example, one audio file that just contains voices, no music, goes to Simon Says for automated transcription which is then posted to our website about two hours after each show. A second complete show with all music and interviews is then compressed and posted in its entirety to both the NABShowBuzz.com and DigitalProductionBuzz websites. 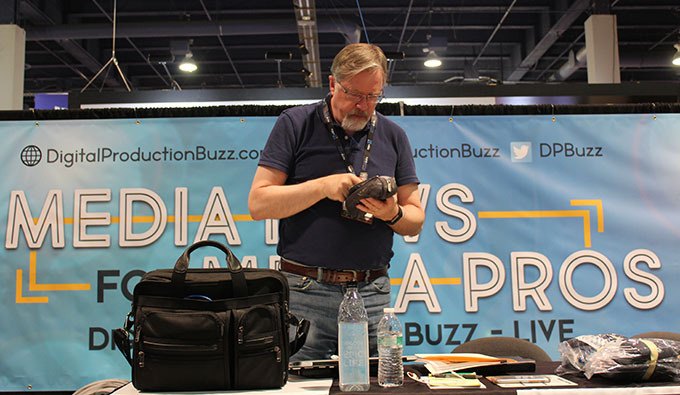 Next, we break down each show into individual interviews for inclusion in our daily highlights show, as well as posting to the NABShowBuzz website. This means you can either listen to the entire show or just a specific interview. As you can imagine, getting all this to work takes a lot of planning. Here, Trevor Horton, our lead editor, and I are talking about codecs and workflow. NOTE: With other people, you’d assume this was a joke. However, as you know from my other work, talking about codecs and workflow is something I actually enjoy! Aside from production, I also have a team of people working on social media and marketing, headed by Laura Peters (above) and ably assisted by Annabelle Lau and Paulina Borowski. We’ve designed an entire social media strategy to get the word out, which I’ll write up later this week as a separate article. Finally, when every cable is in place, tested and dressed, we will go to air – starting later today at 11 AM Las Vegas time. For now, though, well, let’s just say there still a bit of work left to do. Please listen – I have a great deal of fun presenting these shows and there is a LOT of new technology that we’ll cover. And, as always, let me know what you think.